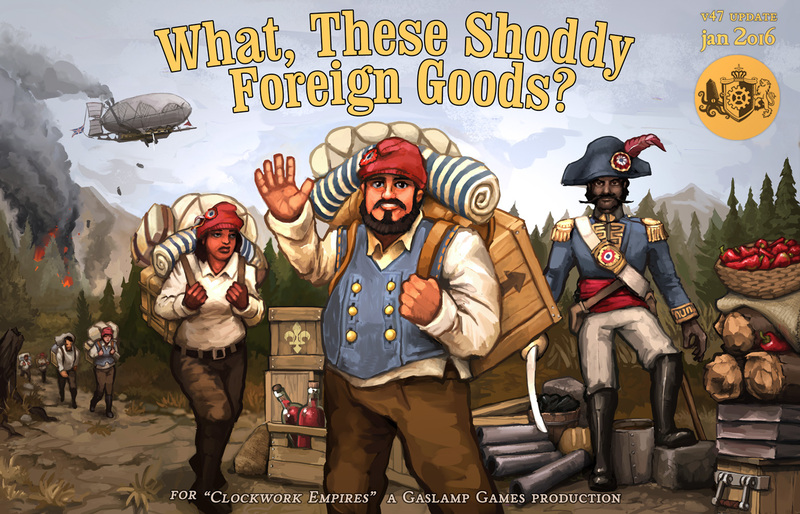 Clockwork Empires January Update: WHAT THESE SHODDY FOREIGN GOODS? We have also updated our Clockwork Empires: Development Progress Report! It contains the annotated changelog and possibly extra secret saucy details maybe or at least a new picture of a cat so check it out! food has been reworked to be way more interesting! added first iteration of Trade Depot. balance: now, in general, events that lost you prestige before will now lose you relations with all nations. Preserved/Tinned goods are now more expensive to create, but function as superior trade goods. Their recipes have been updated accordingly. all food recipes have been given qualities and module requirements as appropriate for their quality. higher class characters will now prefer higher quality food. balance: exhaustion chance for foragables has been significantly lowered to allow players to experiment with the new recipes. be warned: crop fields will now be entirely cleared if you change the crop type you’re growing! Clay pot decor are now boxed modules. FIXED: displayed cost for “Decent Cabinet” was wrong and has been corrected. FIXED: an item is only added to the commodity list if it is owned by a player.